If there's anywhere in the world you should have a boat, it's in Florida. With a fourth of the navigable coastline of the continental US, lakes in every back yard, and rivers enough to circle the globe twice, there is something for everyone. There are no mountains or even hills in this state. Only water, and lots of it. roaming off on the next adventure. I've spent a lot of time in boats over the years. 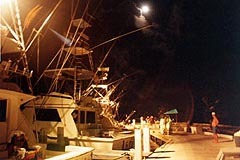 Trailerable boats, sportfishing boats, and some outright yachts. I've boated most of the coast of Florida, both Gulf and Atlantic, including the Keys and the northern Bahamas. I've wandered up and down the St Johns River, down the Kissimmee River to Lake Okeechobee, and across the Okeechobee waterway coast to coast more times than I can remember. Then there's the occasional run of the intercoastal waterway from Key West to the top of the Cheasapeake Bay. This is not a cruising guide. Buy one and keep it handy for your trip. I'll intend to put here info not found in the guides, and items to keep in mind when you make a trip. I'm aiming principally for the small boater, as veteran cruisers could write their own guides. over south dock, Walker's Cay, Abacos. 1300 miles of navigable coastline. 51000 miles of navigable rivers. I've recently begun filling the Boating Pages after years of "coming soon". The intent is to put information not normally found in the various guides online here where it might be useful. Items about small boats and the big ocean, gleaned from having been there. 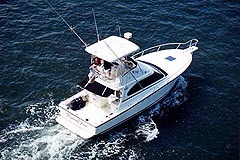 I've not found a really good reference on small boat (20-25' trailerable) operation well offshore, but that's where most of the fishing people roam, and the size boat most use. Things learned about successful and not so successful trips will be passed on to those just starting out. What to have beyond the CG list. Notes not in the books. Places to keep a sharp watch. Bimini. How to get there, what to do. The Freeport - Lucaya area. Some safety info not normally in the books. From SR 50 to Glen Silver Springs. "....there is nothing - - absolutely nothing - - half so much worth doing, as simply messing about in boats........"